SpaceX is solving a fundamental blocking problem in spaceflight. This is a great example for the church where a similar blocking problem needs to be addressed. As with all such problems we need a new approach, a new way to see the problem and find a solution. Sometimes good examples help us to see our situation in a new light, and great examples can even encourage us to do something about it. Here is a truly great example from SpaceX, the Californian commercial spaceflight company owned and run by Elon Musk. First the example, then we'll take a look at how we might apply it to the church. Spaceflight? Church? There seems to be a disconnect, perhaps. Well no, actually. But more on that later. Spaceflight is expensive - Here's the situation as Elon found it. Spaceflight is extremely expensive; launch costs for placing a large communications satellite into geosynchronous transfer orbit (GTO) are typically £150 million or so. This is what I call a blocking problem. It blocks further progress. Spaceflight cannot become routine on a large scale with launch costs of this order. For decades these high costs have been regarded as unavoidable. What might be done to reduce them? By carefully designing the company's Falcon 1 and Falcon 9 rockets to be as efficient as possible, both in terms of manufacture and deployment, Elon Musk has been able to trim the launch cost considerably. But it's still too high, much too high. Not being one to give up easily, he realised that the fuel costs are less than 1% of the cost of the rocket, so if a rocket could be reused over and over again (like an aircraft) the cost per launch could fall very dramatically. 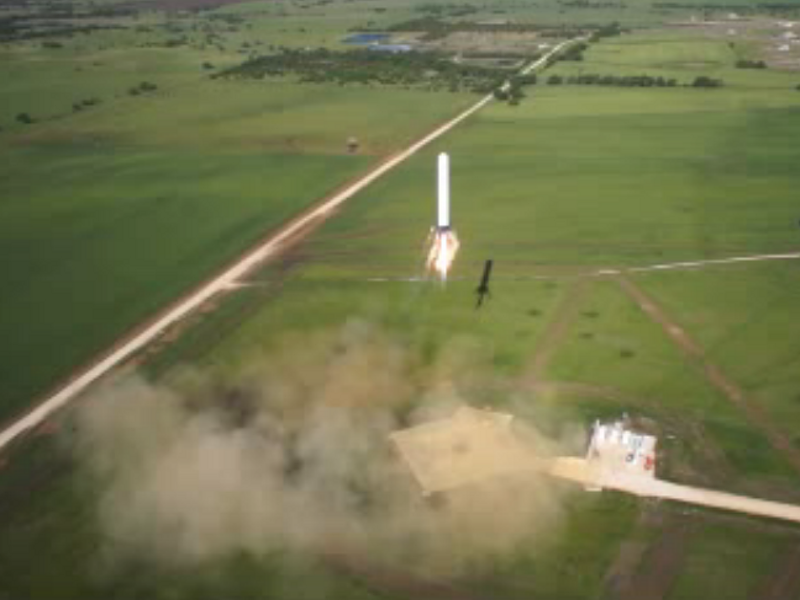 Grasshopper - So this is what SpaceX has been attempting with its 'Grasshopper' project. 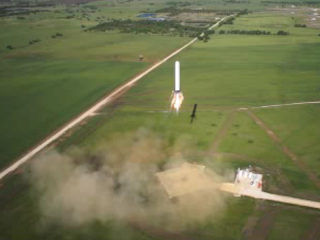 Grasshopper is a test version of the company's standard Falcon 9. It has flown five times so far, higher each time. The recent flight to 250 m is amazing to watch. It goes up, it hovers for a while, and then it returns to the launch pad and lands! Watch Grasshopper do it's stuff in this SpaceX video. Don't miss it. It's truly astonishing! On the next cargo flight of Dragon to the International Space Station (ISS), SpaceX intends to 'land' the first stage on the sea as a trial run. They don't expect to succeed on the first attempt (though I suspect they may do better than most people think). But they will persevere and when they are comfortable with the process they will eventually return an intact first stage to the launch pad. And then they'll work on minimising the refurbishment and refuelling so that the same rocket can be flown several times a week, perhaps even several times a day. And they plan to work on returning the second stage as well. I'm sure you can see how this will change everything. Space launches will become far cheaper and new markets for launch services will develop as a direct result. And the church? - Ah, the church! You see the church has a similar problem, something that has been taken for granted like high launch costs in the rocket business. Church in the West has seen falling numbers, falling influence, falling relevance to ordinary people. All sorts of programmes have been organised involving better music, excellent teaching, novel forms of meeting, cafe church, simple church, exciting children's programmes, house church and more. None of these things in themselves has made a fundamental difference. Like Elon Musk and SpaceX we need a new way of thinking. And we already have one! Alan Hirsch has put his able mind to work and has identified six key elements that are essential but sufficient for explosive and continuing growth. Taken together (and he makes it clear that they must be taken together to be effective) these six elements can make a dramatic difference. The first key element is 'Jesus is Lord' and that should surprise none of us. But what are the other five? You'll have to wait for a later post to find out. But if you can't wait, get a copy of Alan's book, 'The Forgotten Ways' and start reading. It's excellent stuff, illuminating, exciting, and carrying a real hope for the future of the church in the West. Does it seem to you that church in the western world is advancing or retreating? Why is the western church not growing explosively like the church in China or India? Have you heard Alan Hirsch speak, or read any of his books? Is Jesus truly at the very centre of all you do and say and think?